The history of education in the Muff area can be traced back to the end of the eighteenth century and early nineteenth century. Reports of that time make reference to a number of “schools”, many of which would have been hedge schools or little better, held in very poor accommodation. Among the schools mentioned are a school in Balloughly in 1815, where Mathew Harrison and John Caffrey taught for fifteen years, and a school at Cortubber in 1823. 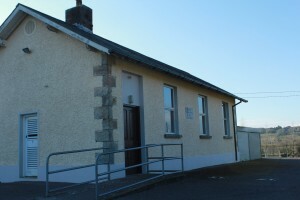 By 1826, a school had been established at Laragh. Classes were held in the church and lessons were taught by Peter Brady. Around 1835 a school was erected at Edenagully, on a plot of land given by Mr. White of Nevinstown. The first roll books used in Muff school were initially used by another school. This school was at Leiter and was originally situated along the “bog road”. We do not know when it was built but a report of 1835 refers to “a day school kept by P. Tighe” – which was probably Leiter school. In that year 74 children were enrolled on its books but numbers had been diminishing over the previous few years. Leiter school was closed for some time before re-opening on January 1st 1857. It was then described as “ a good house of stone, sand and lime walls, newly repaired, but formerly built for and used as a schoolhouse, well lighted with two large windows, roof thatched with straw, an earthen floor, two fireplaces”. There was one classroom with the teacher’s house adjoining. Bridget Matilda Tighe was the teacher and the site was owned by her mother. For reasons unknown Leiter school was closed about 1867. A possible explanation is that it transferred to a schoolhouse on Maharry’s Hill, known locally as the “Hill School”. In 1876, Fr. O’Reilly wrote “the present house is only a temporary one. I am in treaty with the landlord about getting a site for the erection of a new school”. His efforts were continued by Fr. 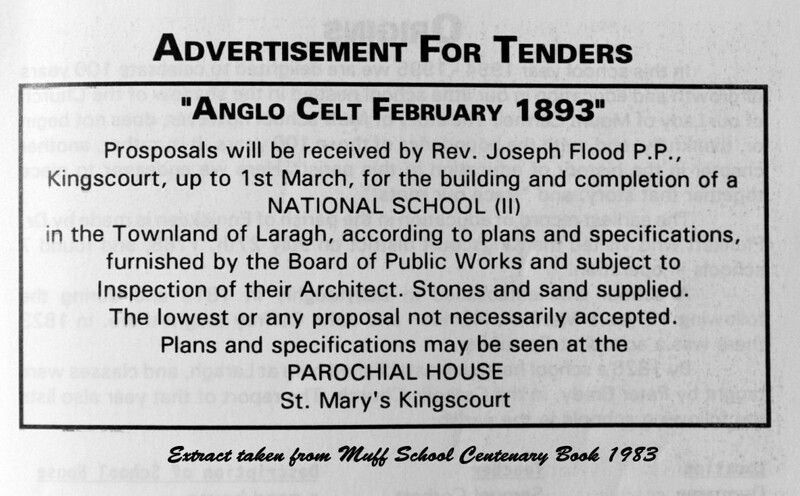 Flood when he was appointed as parish priest and eventually in 1893, work commenced on a new school building on the present day site. On November 19th 1894, Mrs. Glynn and her pupils transferred from the Hill school to Muff. Very little changed in Muff until 1973, when Edenagully school and Muff school amalgamated. Thirty-eight pupils transferred to Muff, bringing the total number to eighty-two, with three teachers. In 1983, Fr. Tehan applied for an extension to the school and a site was purchased from Mr. Charles Clarke. However, due to government cutbacks the sanction was withdrawn and the school remained as it was in very poor condition, until 1991. In that year, following a renewed application by Fr. Farrell and the relentless effort and support of the local people and a new school committee, a new three classroom school was sanctioned. In June 1992, the school was completed and the teachers and pupils moved into the newly built school. Later, due to an increase in pupil numbers the old school was renovated to accommodate a fourth teacher and classroom. In addition, a new play area, including a football pitch and basketball court where built, which greatly enhanced the recreational facilities of the school. Today, five teachers and over 100 pupils work together in the tranquil surroundings of the foothills of lovely Loughanleagh mountain.